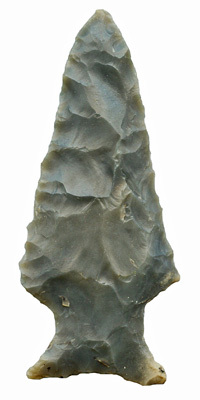 General Description: The Motley type is a medium to large sized, expanding stemmed, widely corner notched projectile point which may have strong downward projecting shoulder barbs. The corner notching is typically wide and rounded which leaves a narrow stem neck width and wide shoulders. The blade edges and the base are typically slightly convex or straight. The overall blade form is trianguloid and is always widest at the shoulders. Basal grinding may be present although it occurs in low frequency. This point has been found with Wade points in caches. This point is called the Epps (Ford and Webb 1956:116) type in Louisiana and eastern Texas (however the Epps type are rarely barbed). Motley points may be a prototype for wide corner notched Snyders points. Motley points are found over a large area from the Deep South to the Midwest. It has been found in sites in Mississippi, northern Louisiana, Alabama, Tennessee, Arkansas, and Kentucky. They can also occur in the Ohio River Valley, Indiana, eastern Missouri, northeastern Texas and most of mid to southern Illinois. The size of the Motley point can range from 42 mm to 120 mm in length with the typical point being in the 68 mm range. The average width of the blade is 34 mm with the range being from 25 mm to 46 mm. The average thickness is 6 mm with the range being from 5 mm to 8 mm. The Motley point type was named by William G. Haag in 1955 for specimens he found at the Motley Place in northeastern Louisiana.